One writing’s land mines writing is the danger of writing quotes out of context. In order for your writing to be powerful, it must be faithful to truth. In a Bible study group, one friend struggled with the concept of forgiveness. “But scripture says, ‘Vengeance is mine,’” my friend said. “I have been hurt and I have the right to get my own back." It was then that the rest of the group gently pointed out the context of those words: “Vengeance is mine … says the Lord” (Romans 12:19). For many years, this dear man had harbored resentment and bitterness, believing they were his personal right … all because he had attributed those words to the wrong speaker. 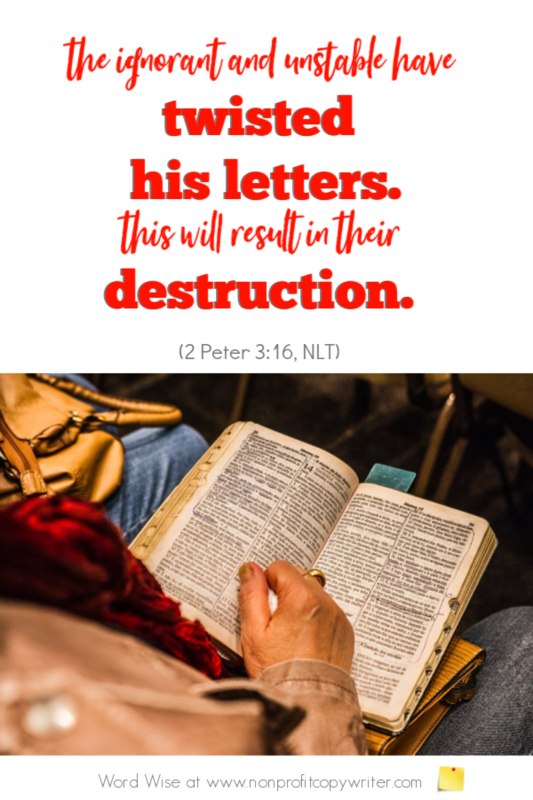 If he had taken a few moments to read the entire passage, my friend would have discovered that the reference is to God’s words delivered to the nation of Israel through Moses (Deuteronomy 32:35). The reference was placed smack in the middle of a passage that describes different ways a Christ-follower is to show genuine love, generosity, and hospitality — even when wronged and leave vengeance up to God. The rule of thumb for using and writing quotes is this: is it accurate when it stands alone and out of context? Thank You for Your Word. Let me read it and quote it accurately. Keep me from skewing the truth.